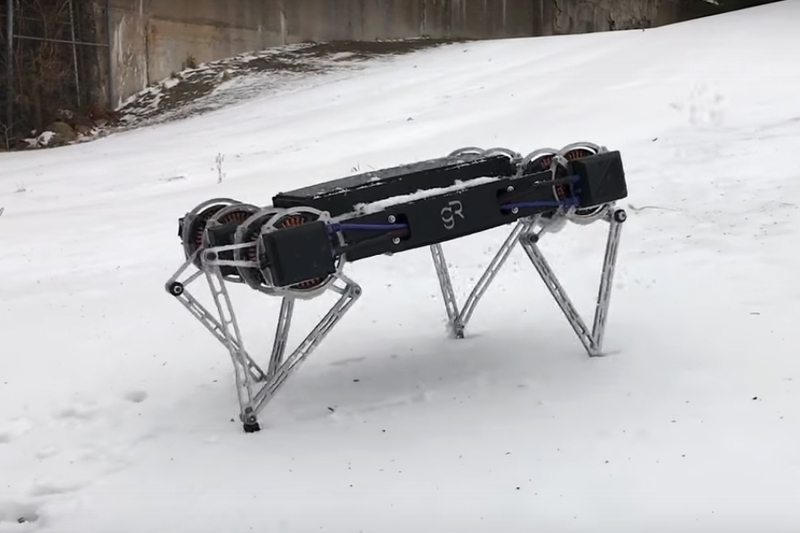 Ghost Robotics—a leader in fast and lightweight direct-drive legged robots—announced recently that its Minitaur model has been updated with advanced reactive behaviors for navigating grass, rock, sand, snow and ice fields, urban objects and debris, and vertical terrain. The latest gaits adapt reactively to unstructured environments to maintain balance, ascend steep inclines up to 35º, climb up to 15cm curb-sized steps, crouch to fit under crawl spaces as low as 27cm, and operate at variable speeds and turning rates. Minitaur’s high-force capabilities enable it to leap up to 40cm onto ledges and across gaps of up to 80cm. Its high control bandwidth allows it to actively balance on two legs, and its high speed operation allows its legs to navigate challenging environments rapidly, whilst reacting to unexpected contact. Ghost Robotics is designing next-generation legged robots that they claim are superior to wheeled and tracked autonomous vehicles in real-world field applications. They are also attempting to substantially reduce costs to drive adoption and scalable deployments. Whilst a commercial version of the Ghost Minitaur robot is slated for delivery in the future, the current development platform is in high demand, and has been shipped to many top robotics researchers worldwide (Carnegie Mellon, University of Pennsylvania, University of Washington, U.S. Army Research Labs and Google) for use in a broad range of research and commercialization initiatives. “We are pleased with our R&D progress towards commercializing the Ghost Minitaur to prove legged robots can surpass the performance of wheel and track UGVs, while keeping the cost model low to support volume adoption—which is certainly not the case with existing bipedal and quadrupedal robot vendors,” said Jiren Parikh, Ghost Robotics, CEO. In the coming quarters, the company plans to demonstrate further improvements in mobility, built-in manipulation capabilities, integration with more sensors, built-in autonomy for operation with reduced human intervention, as well as increased mechanical robustness and durability for operation in harsh environments. Watch this space.